Poet Christina Olson: I don’t think a poem that imagines infectious diseases getting together for a holiday party should take itself too seriously, and I think that Lisa hit just the right note. It’s joyful and a little sinister. That, and I love the palate of colors: the red, and the green, and the blue. Artist Lisa Sette: The language. I’m a very visual person, and this poem carries me through visually. Poet Christina Olson: I dig the inclusion of the older woman decked in her matching holiday outfit, and the cigarette dangling from her lips. And I’m oddly glad that you can’t see all of her face. What surprised you about this piece, once you saw the artwork and poem together? Artist Lisa Sette: The conversation worked. The image and poem had more points of intersection than I thought they would. When I read the poem, I instantly thought of this image, but it surprised to see how often moments in the poem were also in the image. There are visual links to the poem that anchor it. Poet Christina Olson: This is just how I would have pictured the poem had I actually pictured the poem. Or, to put it another way: my friends and I used to throw these ridiculous Christmas parties. Ugly sweaters, a ham in the oven, too much bourbon, smoking in the garage just because we could. The image Lisa chose for this piece isn’t too far off from any photograph taken at those parties, and I love that. I guess this makes me sound as if I based the infectious diseases on my friends. Friends, I apologize. When you begin a piece of visual work (or, if that’s too broad, when you began this piece), is it color, shape, or some other aspect that you follow? Artist Lisa Sette: The reason I took the picture in the first place was because I thought the drag queen had an amazing outfit. I photograph with a flash and movement because I have little control over it. I like the surprises that I get from blurring color and light. I like trying to harness that, yet knowing that something surprising will always pop up. Street photography has always moved me. And drag, people or voices that are in critique of the mainstream and yet also have a bit of camp or wit. Poet Christina Olson: I come from a group of people who document everything with Nikons, and I’m learning my way (clumsily) around an SLR, and occasionally I will turn to a photograph and think, That’s what I want to capture in a poem. It’s not writing after a photograph so much as it’s writing to capture the same sort of feel that’s in a photograph. There’s a photo that my grandmother took in the early seventies—it’s of my grandfather and my aunt, and they’re sitting on a concrete patio. It’s summer. My grandfather’s wearing taupe socks and shorts, and my aunt has lovely knees, and they’ve pulled the coffee table outside and are drinking gin from short glasses and playing cribbage. And for whatever reason, you can only see their faces from the chins down. There’s something about that small, humid moment that makes me want to write a poem. If you had to represent the Broadsided of “At the Christmas Party for the Infectious Diseases” with one word, what would it be? Artist Lisa Sette: Smear. Chaos. Color, chaos, actually. When I think of diseases, I think of chaos. Germs. Mucus. Blood. Poet Christina Olson: Bill Bryson’s The Mother Tongue, Tony Hoagland’s Unincorporated Persons in the Late Honda Dynasty, Etgar Keret’s The Bus Driver Who Wanted to Be God(again, again). Artist Lisa Sette: I’m reading Trespass by Valerie Martin now, and it’s amazing. Also The Archaeology of Martha’s Vineyard,by William A. Ritchie. Artist Lisa Sette: Only on Broadsided… and in my garden. I haven’t been seeking out proper art lately. 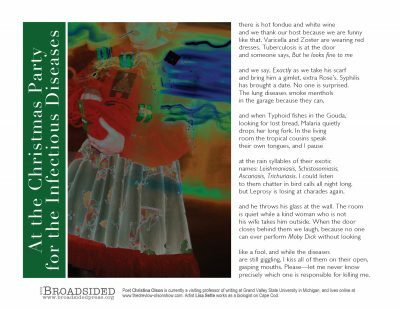 Poet Christina Olson: Thanks so much to Lisa for this beautiful work, and to Broadsided Press for this opportunity to get infectious-disease poetry out in the world. I really hope I see this in a grocery store. Better yet, I hope I see someone looking at it in a grocery store. Artist Lisa Sette: Nope. I’ve already said enough. Poet Christina Olson’s first book of poems, Before I Came Home Naked, will be published by Spire Press. Her work has recently appeared in Brevity, The Best Creative Nonfiction, Volume 3, Gulf Coast, and Black Warrior Review. She is currently a visiting professor of writing at Grand Valley State University in Michigan, and lives online at www.thedreflow-olsonshow.com. Artist Lisa Sette holds a BFA in photography and a master’s degree in biology.